::: DJ ALFONSO'S MUSIC CABINET :::: RENDEZVOUS! Presents Chris Tillotson (Starving Daughters Vinyl Impressions)! RENDEZVOUS! Presents Chris Tillotson (Starving Daughters Vinyl Impressions)! Friends...it's that time again! Join us next Friday, August 8th for another edition of RENDEZVOUS! This month we are excited to welcome world-class record collector Chris Tillotson (http://starvingdaughtersvinylimpressions.blogspot.com/) to the decks at our lovely Hyperion Tavern! Though Mr. Tillotson may not be a household name (yet), if you consider yourself a serious collector of French and Italian soundtrack and/or library records, you more than likely have downloaded some MP3's off his blog. Come nerd out with us as this man will surely be bringing some rare heat to the tables. We will also be continuing with our monthly raffle of a DVD or Blu-ray courtesy of our friends at Severin Films!! Simply buy a beer, drop a raffle ticket into the conveniently placed raffle jar, and you're entered! Just be sure to ask the bartender for a ticket when you order a beer (a ticket will be randomly drawn at approximately midnight and the winner MUST be present. One entry per beer purchased. The more you drink, the greater your chances of winning!). 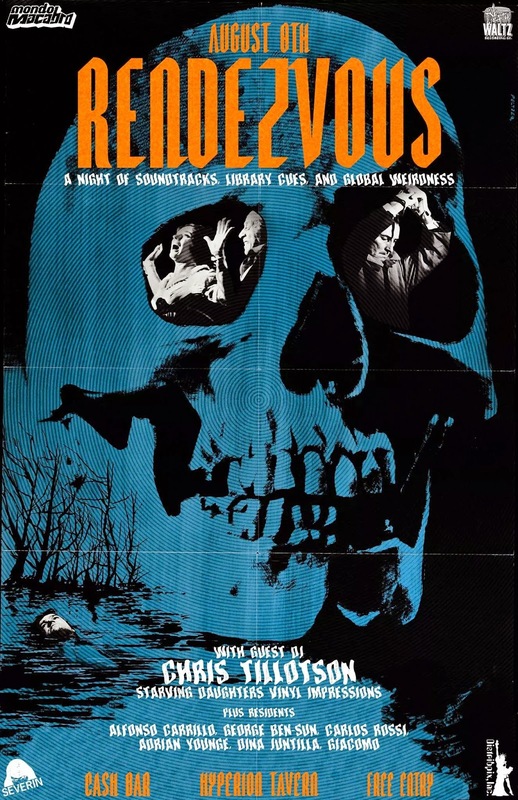 As always, we will be screening THREE giallo and cult erotica films on the huge projection screen, courtesy of Severin Films, Distribpix Inc., and our NEWEST sponsor...Mondo Macabro!! RSVP on facebook here.